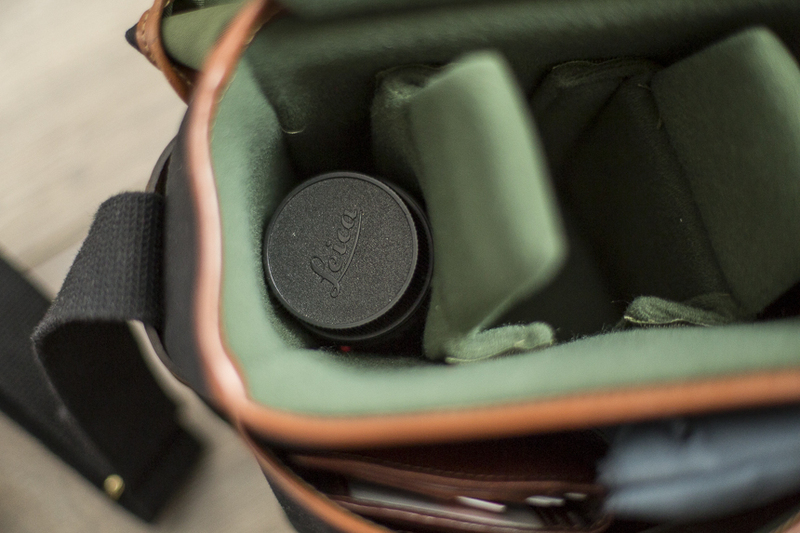 When I bought my Leica M9 in 2010, I bought this little sturdy bag in an impulse. Usually I think before I purchase something, but in this case, I got a 50% discount, because I just bought an M9. Before this moment, I only had big bags for SLR kits, so I thought that I’d need a smaller bag anyway. Back home, my wife asked me why I bought an ‘old mans bag’ with my new Leica and I almost brought it back. Luckily I didn’t. In the past four years that I have this bag, it has been very convenient in several ways. But let’s start with the specs first. 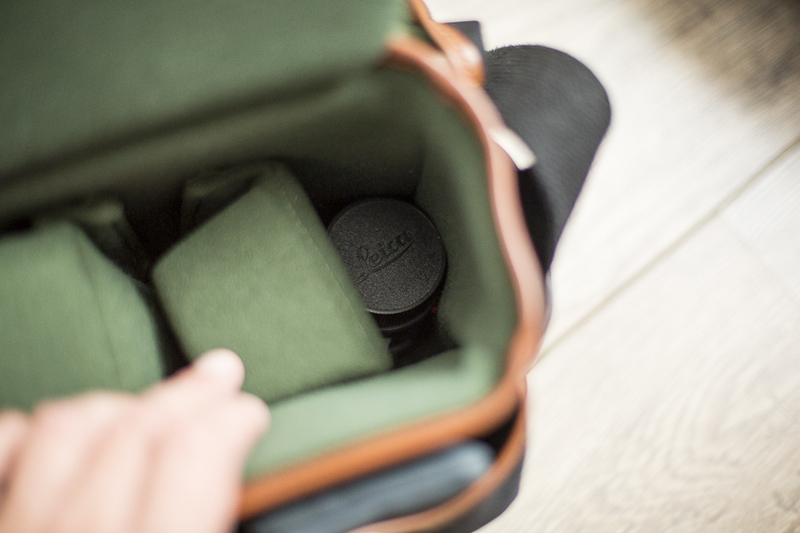 The Hadley Digital is equipped with two compartments: one for your camera gear and one for small stuff. Although the bag looks small – and it is small – it fits a remarkable amount of gear. It fits a camera with lens attached, two other lenses and still quite a bit of smaller things. I managed to get the 75 summarit with hood attached in the bag and there’s still room for the camera with lens to put on top. On the other side of the bag I fitted the 28 elmarit and if you’d want to, you could stack another lens on top. Or keep your batteries in there. And on the other side I put the 28 elmarit. You could stack another lens on it. And here is the M9-P with the CV 40/1.4 on top. Easy access! The Billingham Hadley Digital is a versatile bag. It’s very convenient for a short day trip if you need nothing else than a camera, a few lenses and your wallet. Weighing less than 500 grams it’ll be light enough to carry it around without hurting your back and shoulders, yet three lenses is usually all you need. However, if you need to carry a few extra things, for example a jacket or a bottle of water, the Hadley Digital is too small. For me, the Hadley Digital is perfect for a walk or for visiting friends or family. I like to bring my camera everywhere I go and I want to bring it in a bag. As soon as I need to bring more, I’ll take my Hadley Small. 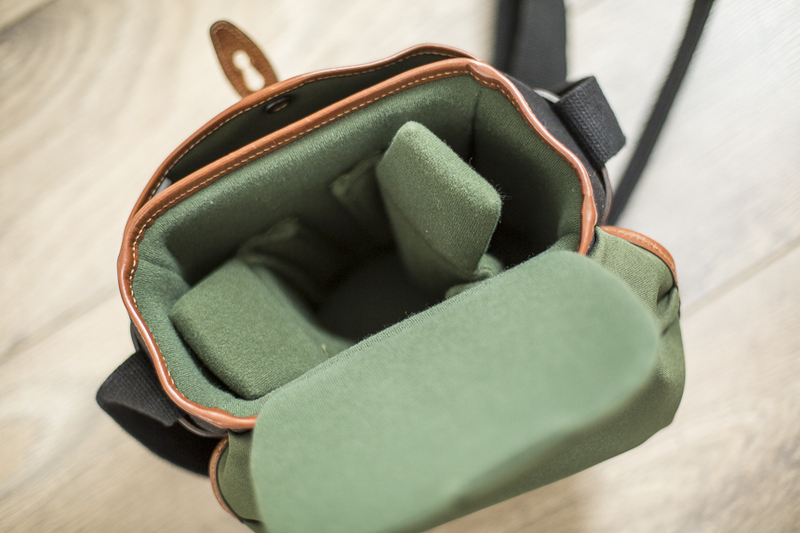 If needed, you can expand the Hadley Digital with the Avea 3 and 5 pouches. The strap is adjustable in size and is wide enough to distribute the weight evenly. 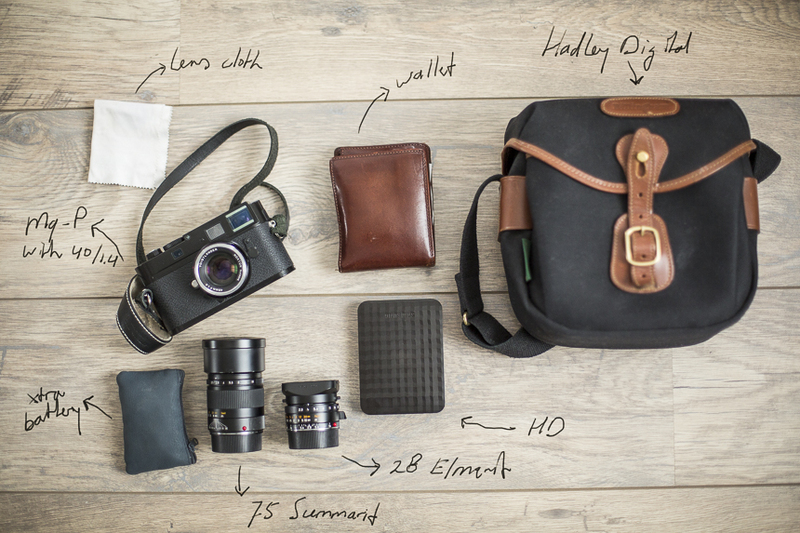 If that’s not enough, you can add the Billingham SP40 shoulder pad. 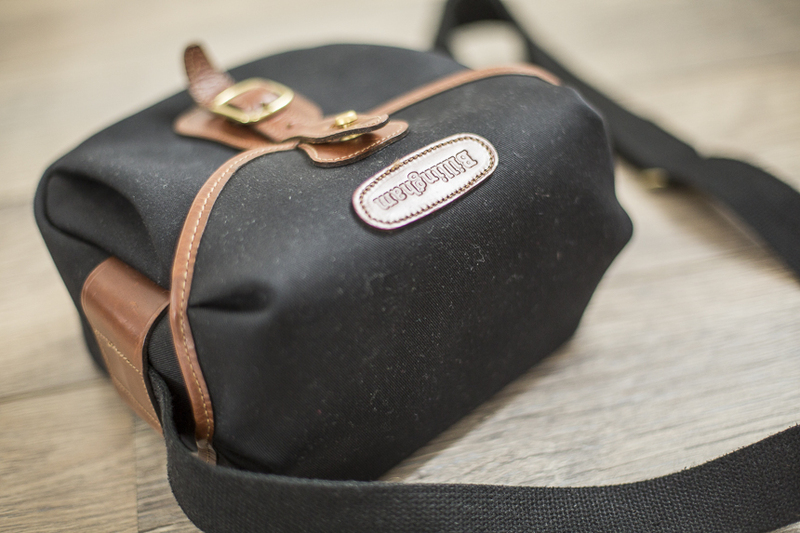 So why pay 180 Euros for a bag that does the same as a Lowepro bag that costs less than one third of this Billingham? Well, there are some features of Billingham that I like and do not find – in that combination – in other bags. First, I don’t like zippers and velcro. Billingham uses its own unique system for closing and opening the bag: it’s silent, secure and will last. Second: waterproofness. I don’t like seperate raincovers and I don’t like plastic. This canvas will get your gear through some serious rain, while it’s still accessible. Third: it fits a rangefinder. 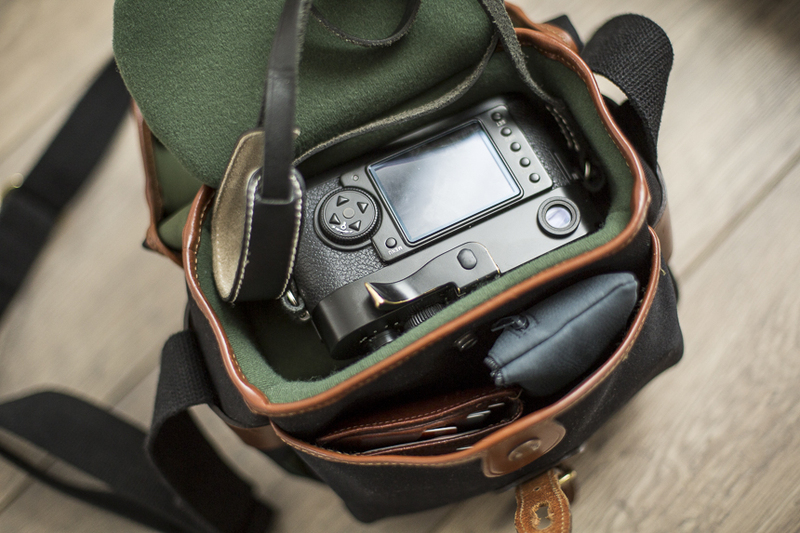 Not so many bags have the right dimensions to adequately fit a rangefinder camera. This one does. In fact, don’t even try to squeeze a 5D3 in. It won’t fit. The interior is customizable, except for the top flap. Yes, this all easily fits. Quite a complete kit for a day of shooting.